2 years and $680k to give museum&apos;s most popular and enduring exhibits the TLC they deserve. HARRISBURG, PA (March 10, 2017) – The State Museum of Pennsylvania in Harrisburg began a long-overdue makeover that started in 2016 and will continue throughout 2017. The renovations to the original exhibits in Mammal Hall will cost approximately $680,000 according to museum officials, but it’s a wise investment in what is one of the most popular and enduring exhibits in the museum since it opened in 1968. According to Pollman, after a school group visits the hall, museum staff can instantly gauge which displays received the most interest that day simply by observing the number of hand and nose prints on the glass. The usual winners of the popularity contest are the two wolves fighting over a kill, a mother White-tailed deer and her fawns, and the brawny bison standing amid a snow-covered field (pictured below). The museum isn’t just for Pennsylvanians. It tells a much older story about North America and everything that inhabited this area since the days of the dinosaurs. Many people remember visiting here as a child, and for families across Pennsylvania it has become a multi-generational reflection point. Those who came here as a child are now returning with their own children and grandchildren. But the museum isn’t just for Pennsylvanians, says Rick Dunlap, Public Relations Director for the Hershey Harrisburg Regional Visitors Bureau (HHRVB). “It tells a much bigger story of North America and everything that inhabited the area long before its namesake William Penn arrive in 1682 to survey the land given to him by King Charles II,” said Dunlap. These preserved animals are original to the museum and may have not been touched since 1968. Mammal Hall, featuring dioramas depicting common and rare species of Pennsylvania in their natural habitats, was one of the original exhibits in The State Museum when it opened in 1968. Records are not clear on when any of the displays may have ever been maintained or received proper attention since the exhibit opened. Museum officials realized the importance of giving these popular displays the attention they deserve. So today, the circular hall is divided by a white barrier that hides a small team of experts hard at work carefully removing the taxidermy specimens in each exhibit. Each specimen is being packaged and shipped to the studio of master taxidermist George Dante of Wildlife Preservation in West Patterson, New Jersey. Once there, each preserved animal will be closely examined for damage and areas that need immediate repair. Most of the animals are original to the 50-year-old exhibit and over time they will develop cracks and splits among other natural deterioration, according to Dante. Once repaired, the animals will be repainted and groomed, before returning to Harrisburg. Meanwhile, Stephen Quinn, a former artist with the American Museum of Natural History in New York, is leading a team that is refurbishing all the trees and bushes which compose the displays, as well as the many detailed murals which provide the background for each setting. The scenes also must remain true to Pennsylvania, because they are all based on real places in Pennsylvania. The vision for Mammal Hall when it was being planned in the 1960’s was to display the native animals of Pennsylvania in authentic scenes that portrayed real settings from around the state. To insure each diorama in the hall included the appropriate plant type, placement of trees and shrubs, and landscape for a real place in Pennsylvania, museum workers formed field parties that traveled around Pennsylvania collecting natural samples, photographs and sketches of each area where these animals would have lived or existed in the past. Every detail was then meticulously re-created so that when a visitor of any age pushed their noses against the glass to get a closer look at the detail of a display, they can imagine being face to face with a real Eastern elk, American black bear, or White-tailed deer in a real place in Pennsylvania. The animals themselves were donated by the Pennsylvania Game Commission and the U.S. Fish and Wildlife Service after state museum curators at the time decided it was unethical to hunt living creatures for the museum. 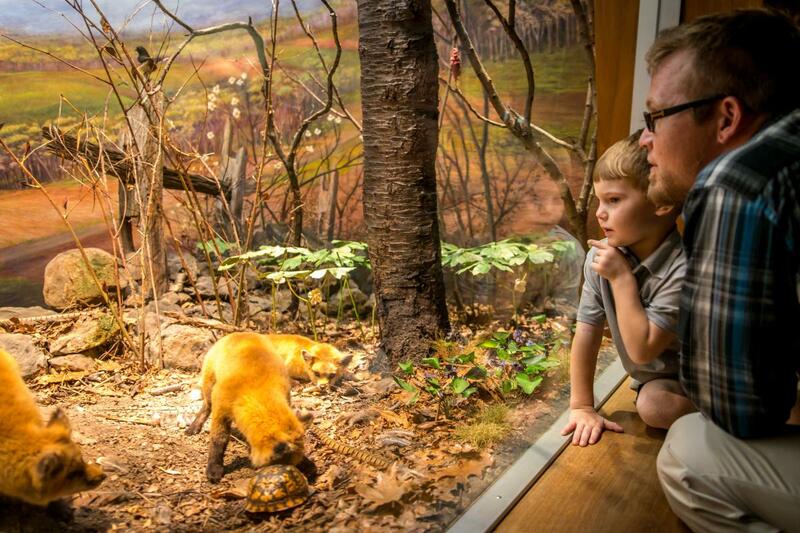 The Red Fox habitat (pictured below) is one example of how specific the dioramas are to real places in Pennsylvania. The scene depicts a family of red foxes on a hillside in nearby Newberrytown. Museum staff who recently visited the location conducting research for the 2016 restoration project, reported the hilltop depicted in the mural was completely recognizable, with only a minor addition of a modern housing development rising up in the distance. The importance of that extensive attention to detail in the research completed by the original field teams cannot be overlooked,” said Dunlap. 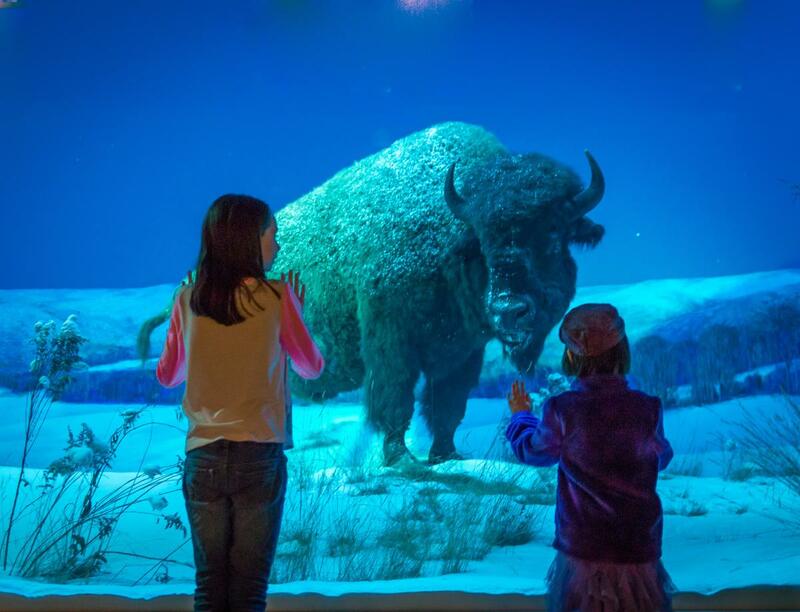 “The authenticity of these exhibits in Mammal Hall was instrumental in its initial success when it opened, and has remained the key to its longevity for the past 50 years. Each display is a snapshot of a moment of natural life, inviting the question: "What happens next?" As someone close to the renovation project, Quinn explains the emotional response we feel when looking at the displays is likely one reason the Mammal Hall has remained one of the fondest memories for generations. “The scenes were created to look and feel so real, they tend to evoke the same emotions we would have if we witnessed these scenes happening in real-time out in nature,” said Quinn. Different scenes create any array of feelings from fear, empathy, sadness, wonder, and excitement, to curiosity, exhilaration, and joy. Since its creation in 1905, The State Museum of Pennsylvania has collected, preserved, researched, and interpreted the cultural and natural history of the state. Over the years, the museum has greatly expanded its collections and modernized its public offerings to serve the needs of succeeding generations of Pennsylvanians. Originally located next to the Capitol, the museum moved to its current location in 1964. It became a bureau of the Pennsylvania Historical and Museum Commission in 1945. The Pennsylvania Historical and Museum Commission (PHMC) is the official history agency of the Commonwealth of Pennsylvania. Created in 1945, we are responsible for the collection, conservation, and interpretation of Pennsylvania’s historic heritage, which we accomplish through the Pennsylvania State Archives, The State Museum of Pennsylvania, the Bureau of Historic Sites and Museums, the Pennsylvania Trails of History, the Bureau for Historic Preservation, and the Bureau of Management Services.